Singapore team won 1 Gold, 3 Silvers and 1 Bronze on the first day of competiton at the inaugural Penang Diving Invitational. Chloe Chan took 2 silvers in the Group A Girls 1m and 3m springboard events while Myra Lee, Arizir Fong and Kimberly Chan took Gold, Silver and Bronze respectively in the all Singaporean Group B Girls 1m springboard event. Timothy Lee did well in a field of 8 competitors in 1m Springboard Boys B and came in 7th with a score of 146.00.In the 3m event, Timothy scored 134.40 to take 5th position. 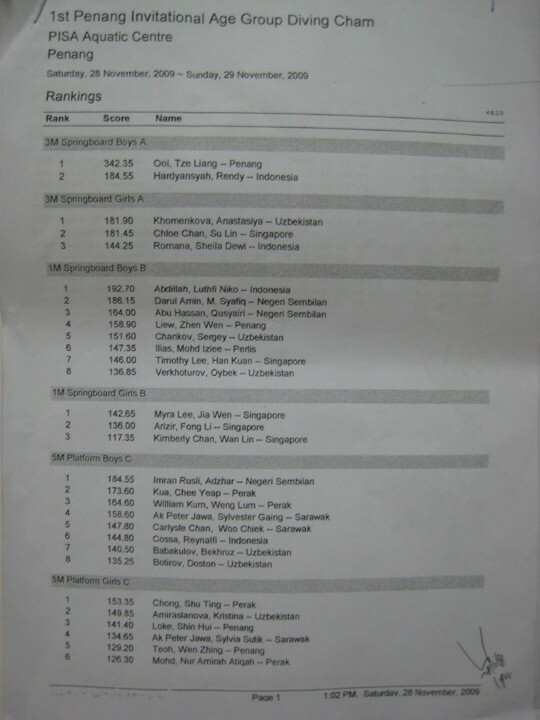 Xinmin was the sole competitor in the 3m Springboard Girls B and she competed with the boys to score 120.30. In the last event of the day, Foo Enyun and Valerie Chua took 8th and 9th positions repectively with scores of 137.00 and 129.55. 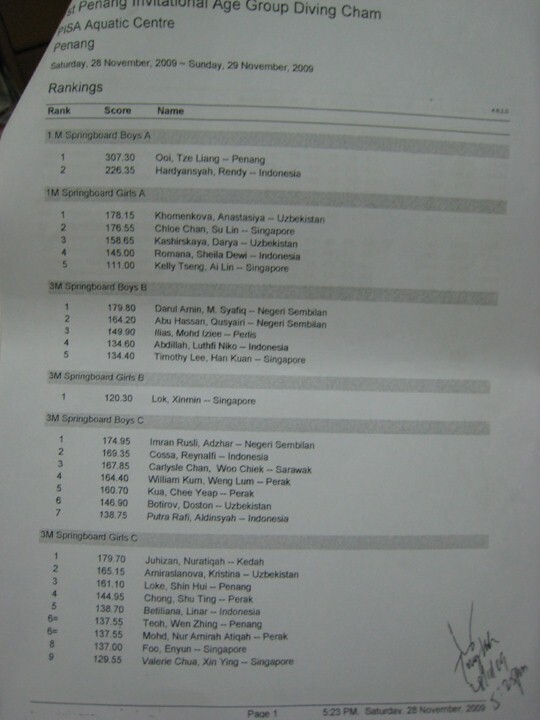 It was a gutsy show by our girls as they did well against a strong field mainly made up of Malaysian State divers. ~ by Singapore Diving on November 28, 2009. What did the Penang diver did to get 300 over points?